PSD to HTML Conversion: In this world of continuous digitization it has become imperative to stay abreast with latest technological advancements and great websites to boost business online. There is a dire need to stay atop competition in order to succeed and this success comes by having a responsive website that cross-platform friendly. PSD to HTML conversion allows you just this and much more. Today, most of the audience is accessible through their mobile devices and like to access quick information from their smartphones. Hence, it is crucial to have your website designed in such a way that is not only visible on your desktops, but has a quick load time on mobile devices too. This ensures that you enhance your reach to a wider online audience without losing precious time and resources. PSD to HTML conversion plays an important role in order to achieve this level of visibility. The number of companies that cater to this arena has increased manifold and it has become difficult to choose the best service provider for your business. You can go online and find different PSD to HTML services offered by various companies, but does that mean all of them are good? They may promise you many services, however, not all of them are equipped to handle the requirement as perceived. XHTMLChamps gives you a comprehensive solution to convert PSD to HTML and presents your business online in a much better way. Do they use latest technologies? Do they have a dedicated team to handle your requirements? Will they be able to deliver your project on time? Does it follow semantic coding practices? Is the website compatible with multiple browsers and devices? Research about similar business line that you are dealing with and understand whether their work has been up to the mark. Check industry rankings of industry experts. The company is responsive to your queries. Do they have good communication channels to interact with you? Type of customer service and duration of the service does the company cater to. Cost estimation of the service provider. Are they at par with other players in the market? Do they meet all costing criteria that you desire? Low costing does not mean low work or vice versa; but it may not hold true in all scenarios. Get a complete estimate for PSD to HTML conversion before proceeding ahead. There is always a chance that your work may get replicated elsewhere; hence, it is best to get a non-disclosure or confidentiality agreement signed before proceeding with PSD to HTML services. If you notice the provider not willing to sign it readily, it may not hold good for you in the future. You need to ensure that your work, concepts and data are in safe hands before proceeding to convert PSD to HTML with the service provider. 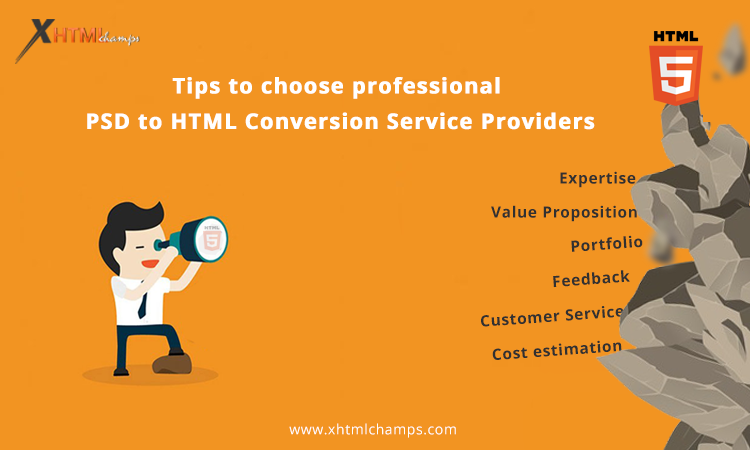 XHTMLChamps provides you with all these parameters to give you pleasant PSD to HTML conversion process without hindering your image and brand.